While I know that many of you have shared the same thoughts and fascinations about “the making of” many of your favorite covers, I have never before seen a case where someone who displayed the same interest in album cover-making as I have embarking on a project where, using her talents as a designer and photographer, she worked to “get inside” both the production processes and the minds of the people who’d taken many of her own favorite covers. Using her professional relationships with photographers including Anton Corbijn, Chris Gabrin, Gered Mankowitz, Terry O’Neill and others, U.K.-based photographer Emilie Sandy collaborated with these talented people several years back to have them re-create (to the best of their ability) and/or re-interpret some of their best-known album covers. The resulting series of images was called “Deja Vu” and, I think you’ll agree, they certainly work to shed a light on the subjects, their approaches towards making memorable album cover images and how they have ultimately influenced a young photographer’s career and her own approach to shooting photos that will endure. Mike Goldstein, AlbumCoverHallofFame.com – Emilie – thanks for taking time to answer my questions and look back through your archives to provide me with some shots taken from your Deja Vu series. As I explained in my initial email to you, I have a daily news feed in which I include stories about all things album cover-related – exhibitions, books, awards, lectures, auctions, etc. 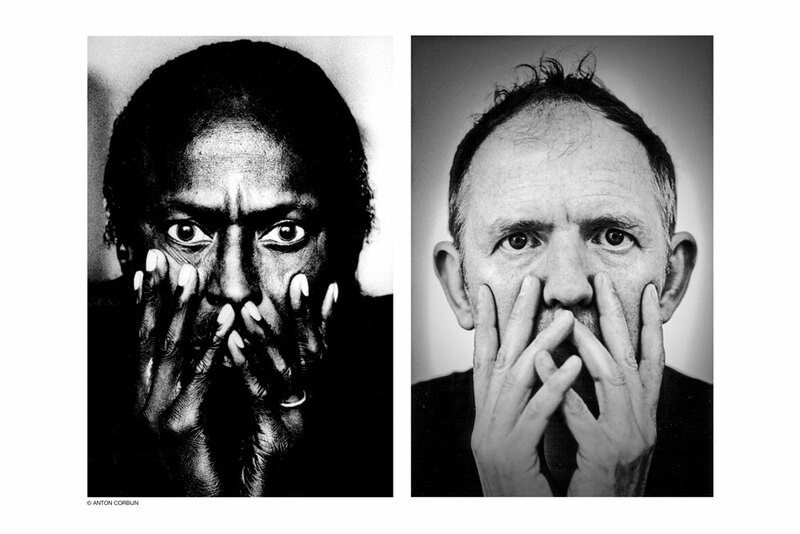 and, while I was doing some research to add some bios to my site, I just read about the project you did a while back featuring highly-regarded photographers starring in re-creations of some of their best-known works. I couldn’t find anything on your site concerning the background behind this project or any anecdotes about “the making of” this series, so I’m glad that you’re willing now to share some of the details with me so that I can relay them in an article about it that I know my readers would really enjoy. 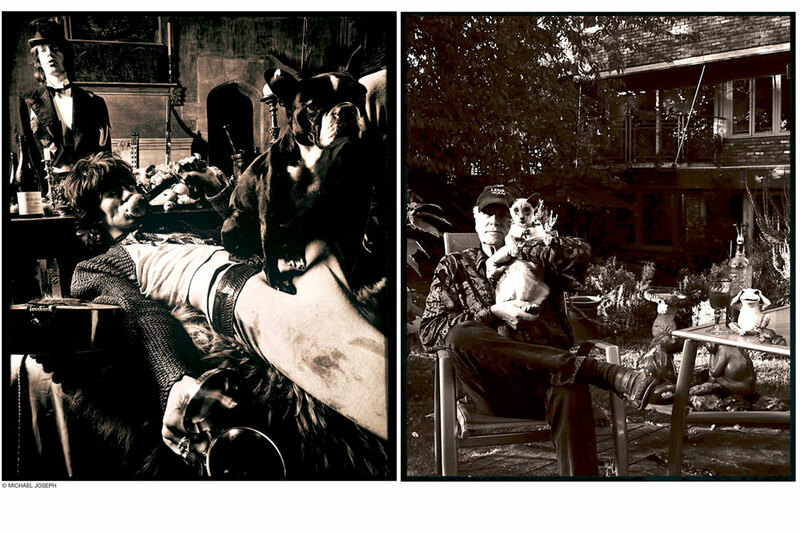 With all that said, let’s get started…Can you tell us what the was inspiration for that particular series of images? Did you have any past experience(s) working with one or more of the featured photographers, or did their reputations, styles or approaches to rock photography provide you with some inspiration as to how to develop the bases for these shots? Emilie Sandy, Photographer – In the late 2000s, I was working at Blink Gallery on Poland Street in London, which is a gallery that specialized in music photography. During my time there, I had the pleasure of working with some amazing and reputable photographers. At the time, I wanted to create a series of ‘photographer portraits’, so I first asked Gered Mankowitz if he would be interested in a portrait, which he agreed to and then invited me to his home. After some thought, I decided against the idea of simply photographing Gered in his home environment – I wanted something different. 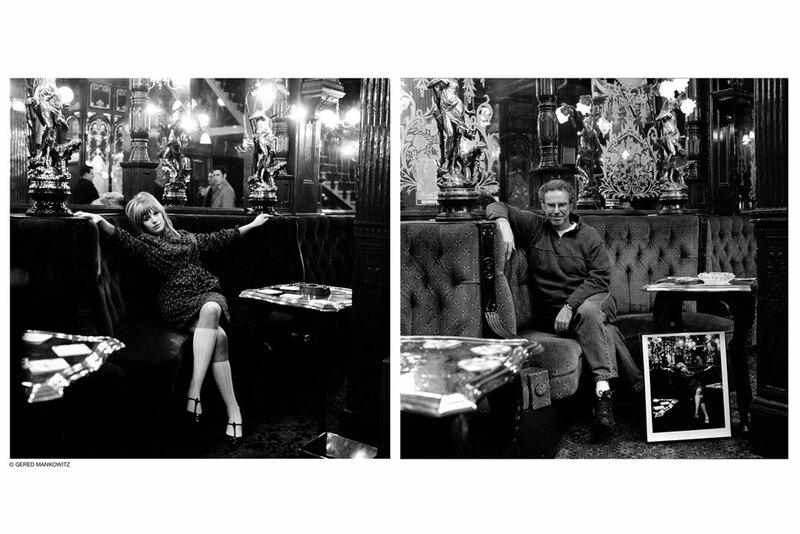 While I was looking at Gered’s photo of Marianne Faithful at the Salisbury pub on Saint Martins Lane that was used on her 1965 record Come My Way, I had a “eureka moment” – I’d photograph Gered at the same pub – and so ‘Deja Vu’ was born…. By the way, he wore white socks especially for the shoot. Mike G – How did you ultimately choose the talent who would work with you on this project? Emilie S – I waited to approach the photographers when they were at the gallery. I did plan on continuing the project after completing the first series of photographs, but I’d taken on too much commercial work at that point and my life got busy in other ways. Weirdly enough – two days before you contacted me – I was thinking of carrying on with ‘Deja Vu’ . That’s the law of attraction for you! MG – I’d absolutely love to see what you come up with next! So, tell me, how involved were the subjects in the process of deciding what you should produce, and did they provide you with any direction and positive or negative feedback? ES – I would set the scene, however, we would work together in order to re-create the image they once shot. The idea wasn’t to copy the original set up exactly but, rather, to have an element and replicate the feeling of the original pose. 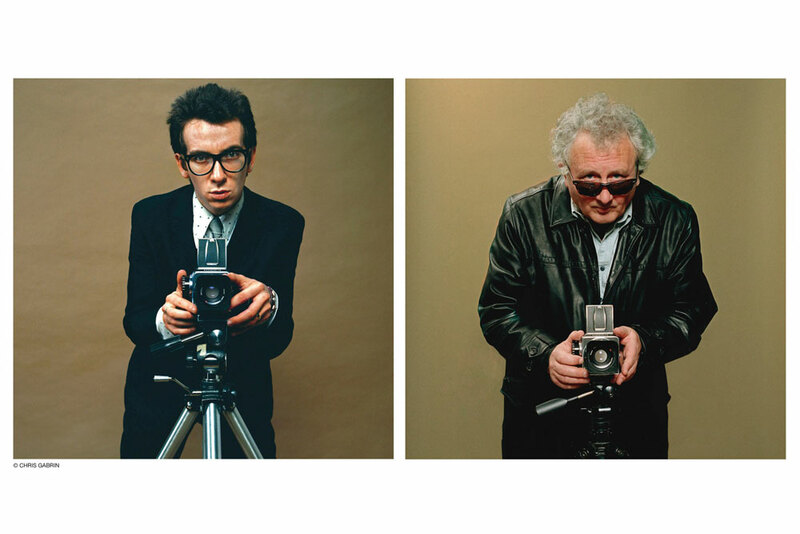 Here’s an example – During the setting up of my shot of Anton Corbijn – with my Hasselblad camera and lights in place – Anton came through the door and kindly suggested that I use his camera. This was the same one that he had used on Miles Davis (!!). He then suggested that we solely use available light, which of course I agreed to and everyone was very happy with the result. Michael Joseph was also quite a collaborative character. We had lots of creative fun shooting a variety of portraits in different locations. I actually took some other photographs of him that day that I ended up not using as they didn’t tie in as well to the original concept. I also got some input and a surprise from Robert Whitaker. He lent me one of his lenses for the shot – the lens he used to shoot the Beatles! – but insisted on taking my portrait first which, a little reluctantly, I agreed to do. 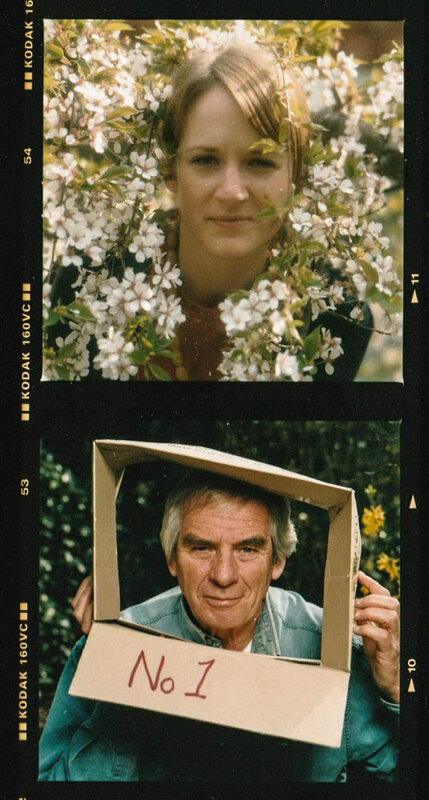 He placed me in a bush full of flowers and told me that I’d appreciate the shot one day but, quite honestly, I haven’t seen them since – they are in the attic somewhere (Editor’s note – since this interview, Emilie found time to go up into her attic to find these photos, which she kindly shares with us below)…. 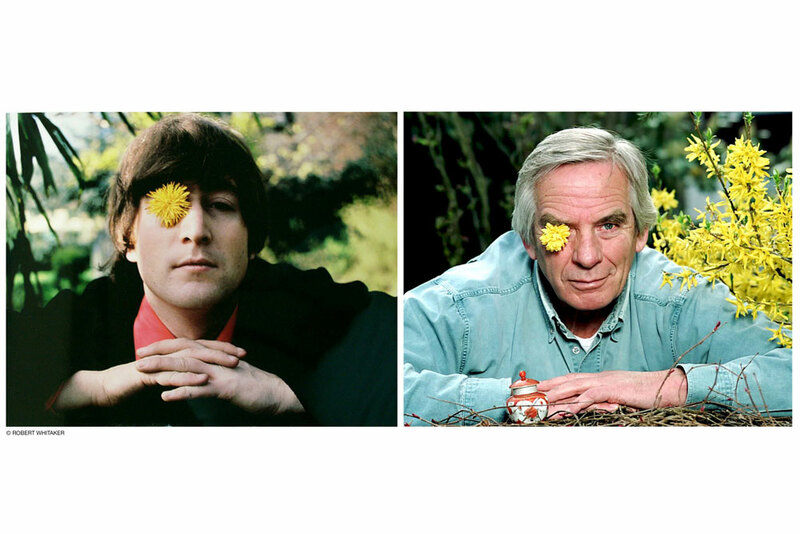 I do recall that Robert explained the reasoning behind the daffodil you see on John Lennon’s eye to me. It seems that they were both – or was it just Lennon? – smoking some cheeky tobacco and having a ‘serious’ conversation about ornamental art and how decorative items are used when they decided to display a little ornament in the photo and to decorate Lennon like an ornament by using a flower on his eye. I’m sure there was more to his description, but this is what I remember now. I really wish that I’d recorded some conversations I had with the photographers – especially Robert, as he was such a conceptual thinker. MG – Please give us an idea regarding the amount of time it took you to come up with the concepts and then produce the final images? Were there any special processes or other aids used? On average, how many images from each shoot were considered before the final decision was made to use the one included in the series? ES – I can’t remember exactly…it was quite a long time ago…each project took as long as it took, really. I used film and so, in comparison to my digital kit today, each one took too long! With regards to selecting the final images, I would typically choose the best three and then choose the final one from there. There was some editing done during the hand-printing process and I did some color alterations on several of the shots. I am working on a new website at present, so I’ve been retouching some of the images in Photoshop for use there. MG – Can you tell us when and where these images were first shown to the public and where collectors can find out more if they’re interested in getting prints from this series? ES – They were first shown at Blink Gallery in May, 2007. We arranged the show so that my new photos were actually juxtaposed next to the original prints. We had a great turn out and most of the featured photographers came to the private viewing and told me they were pleased with the results. If people are interested in buying a print, they can contact me directly via my web site. MG – As I do in all of my artist interviews, if you don’t mind, I’d like to ask you a few questions about some general topics related to album cover art that I’d like to get your opinions on. First off, are you noticing any more or less enthusiasm from your music industry clients to invest time and money in promo photos that stand out? ES – I’m not sure that I can really answer this from a professional point of view as I am not primarily a music industry photographer. My career began by shooting music portraits and live gigs in small and big venues. I met the editor of Clash Magazine when he came to the Blink Gallery and I broke the ice by asking him if he was in a band! We went on to build a relationship from there and he gave me a number of very fun and loose creative briefs to shoot various well- known musical acts for him. With that said, with regards to the importance of promo shots, I think that there will always be a need for them, whether professional photographers are commissioned for the jobs or band members or their friends produce the images themselves. MG – What are your feelings about album artwork-related design and photography these days? Are there any musical acts, labels, art directors, etc. that you think are keeping the field alive or important? Do you think album art matters anymore? ES – There’s a lot of album art work that I love. I went to Central Saint Martins to do a BA Honors program in Graphic Design in 2000 and feel that my love of design started then – even though it’s not entirely my strong point! But I do know what I like and dislike. I’ll give you two examples of work that I like, to keep it simple. I LOVE, LOVE Peter Blake’s album art, especially his cover design for The Beatles’ Sgt. Pepper’s Lonely Hearts Club Band while, for an example of contemporary album art design, I adore Sanna Annuka’s cover for Keane’s Under the Iron Sea. I actually photographed Sanna for another project called ‘When I Am Big’ – it was a collaboration with a good friend of mine who is a designer as well, Kamilla Weinhardt. 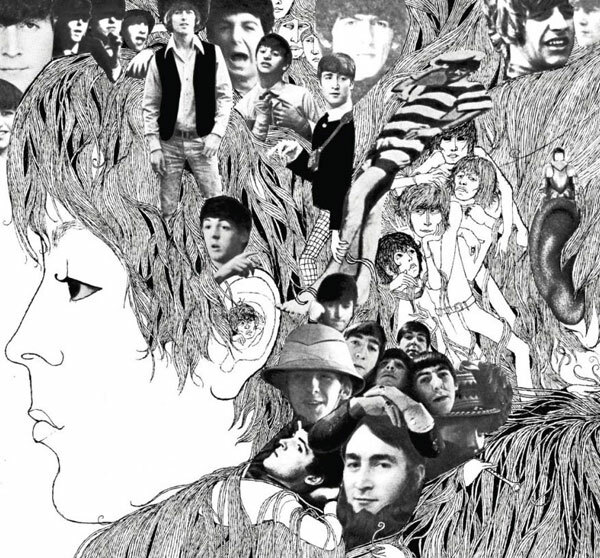 I also love the artwork Klaus Voorman created for Revolver by The Beatles – some of Robert Whitaker’s photographs were included in the design. The hair in the design also stands out for me because it reminds me of my Dad, who was trained by Vidal Sassoon personally and used to cut the Beatles hair in the 1960’s. He had a number of celebrity hair clients – including the likes of David Bowie and Twiggy – and designed and delivered wigs for singer Shirley Bassey! MG – Emilie – thanks so much for your time today and for sharing this with us. A freelance photographer specializing in portraiture, Emilie’s projects range from producing publicity stills for TV network (predominantly, the BBC) and production company clients. She also works on regular editorial assignments and has photographed a wide range of subjects in a multitude of environments, from inmates in a prison to celebrities in their homes. An example of such work is a monthly commission to shoot the front cover for Elite Business Magazine, a publication that showcases entrepreneurs within the U.K..
Born in 1980 in Ajaccio, Corsica, but raised in Iceland, Emilie is the daughter of the late Tony Sandy, an entrepreneur and music promoter who, in the 1980s, brought bands/musical acts including A-ha, KISS, Meatloaf and Whitesnake to perform for fans on the island nation. Her love of music began early on, meeting many of these stars at such a young age (she wishes now that she had a camera back then). Emilie credits two people for setting her on her path towards photo industry stardom – first, her Father, who bought her her first Canon 35mm SLR camera, which she carried around with her ever day, taking photos of absolutely anything and everything and, second, a man named John Stadnicki (a teacher at South Gloucestershire and Stroud College and, according to Emilie, “a very inspiring, creative and humble human being”), who taught her how to use a camera during her Foundation studies. Ms. Sandy received a BA with Honors in Graphic Design in 2003 from Central St. Martins, London, after which she completed the work needed to earn a MA in Photography from the London College of Communication in 2014. After graduating in 2003, Emilie took a position in a photo studio in London where she honed her film processing, developing and printing skills, moving on in mid-2004 to serve as a gallery manager at London’s Blink Gallery, working alongside many of the famed photographers who showed their work there (including Anton Corbijn, Andy Earl, Gered Mankowitz and Terry O’Neill, to name a few), aiding them in the prep and curation of exhibits at the gallery. She left the gallery in late 2007 to begin work as a freelancer, establishing Emilie Photography LTD and along the way adding a long list of work for notable clients to her portfolio. She’s done projects for the BBC, Creative Review, Mentorn, Monkey Kingdon, Shine, Two Four, The Sunday Times, Haymarket Publishing, OK! Magazine and many others. From 2012 on, she’s also worked as a visiting lecturer and instructor, aiding and guiding young photography students at Stroud College, the City of Bristol College and Gloucestershire College, all in the U.K. Her work has appeared in several exhibitions, including shows at the Material Gallery in London in 2010 and two shows – one in 2013 and one in 2014 – at the London College of Communication. Sandy splits her professional and personal time between the Cotswolds and London. In each interview feature, we’ll meet the artists, designers and photographers who produced these works of art and learn what motivated them, what processes they used, how they collaborated (or fought) with the musical acts, their management, their labels, etc. – all of the things that influenced the final product you saw then and still see today. We hope that you enjoy these looks behind the scenes of the music-related art business and that you’ll share your stories with us and fellow fans about what role these works of art, the music they packaged and the people that created them – played in your lives. All images featured in this story are Copyright 2007 – 2015 Emilie Sandy Photography Ltd. (UK) – All rights reserved – and are used by the artist’s permission. Except as noted, all other text Copyright 2015 – Mike Goldstein, AlbumCoverHallofFame.com (www.albumcoverhalloffame.com) & RockPoP Productions – All rights reserved. This entry was posted in Album Cover Artist Interviews and tagged ACHOF, album cover, album cover art, Album Cover Hall of Fame, Album Covers, Anton Corbijn, article, Chris Gabrin, designer, Elvis Costello, Emilie Sandy, exhibition, Gered Mankowitz, interview, John Lennon, Marianne Faithful, Michael Joseph, Mike Goldstein, Miles Davis, photograph, photographer, photography, record sleeve, Robert Whitaker, Rolling Stones, The Beatles. Bookmark the permalink.